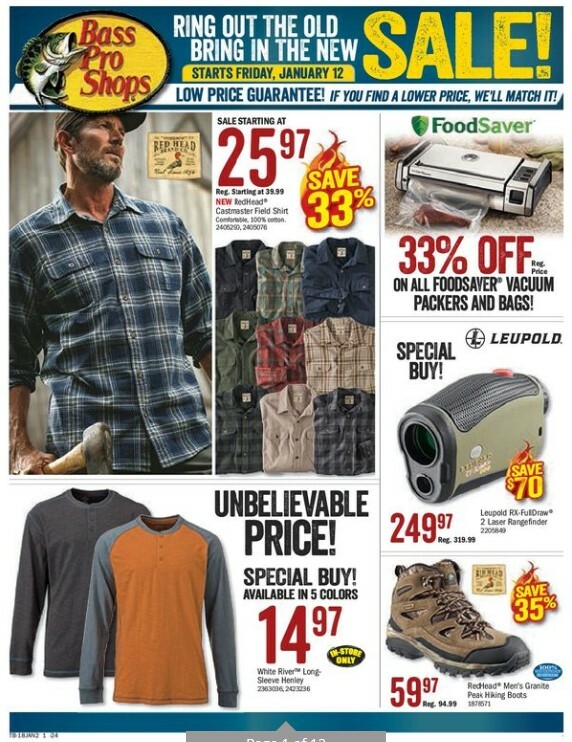 Bass Pro Shops Flyer Canada -January 12 - 28, 2018 -Redhead Castmaster Field Shirt Model 2405290 2405076 $39.99 Regular Price Starting $25.97 Sale Price 33% Savings Comfortable, 100% cotton.All Foodsaver Vacuum Packers And Bags 33% SavingsLeupold RX-Fulldraw 2 Laser Rangefinder Model 2205849 $319.99 Regular Price $249.97 Sale Price $70.00 Savings Separates targets from background. 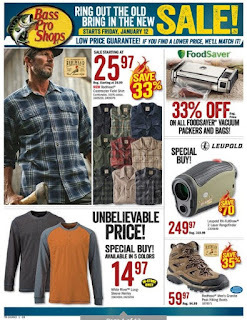 Redhead Men's Granite Peak Hiking Boots Model 1878571 $94.99 Regular Price $59.97 Sale Price 35% Savings Waterproof bootie.Bass Pro Shops ProLite Elite Baitcast Rod And Reel Combo Model 2461293 $69.97 Sale Price Reel features 5-bearing system includes powerlock instant anti-reverse. Magnetic braking system. Rod features RT2 graphite construction. Fuji aluminum oxide guides. EVA split-grip handle. A $99.99 value. Bass Pro Shops Pro Qualifier Spinning Reel Model 2118018 $99.99 Regular Price 33% Savings 8-bearing system includes powerlock instant anti-reverse. Limited quantities. Bass Pro Shop MegaCast Baitcast Reel Model 2334745 $49.99 Sale Price 4-bearing system includes powerlock instant anti-reverse. Magnetic braking system. 12 lbs of drag power. Offshore Angler Tightline Spinning Combo Model 2397491 Starting at $84.99 Sale Price Reel features 6-bearing system including powerlock instant anti-reverse, carbon-fiber PTFE drag system. Rod features hybrid 24-ton carbon fiberglass construction, slip-resistant EVA handles. 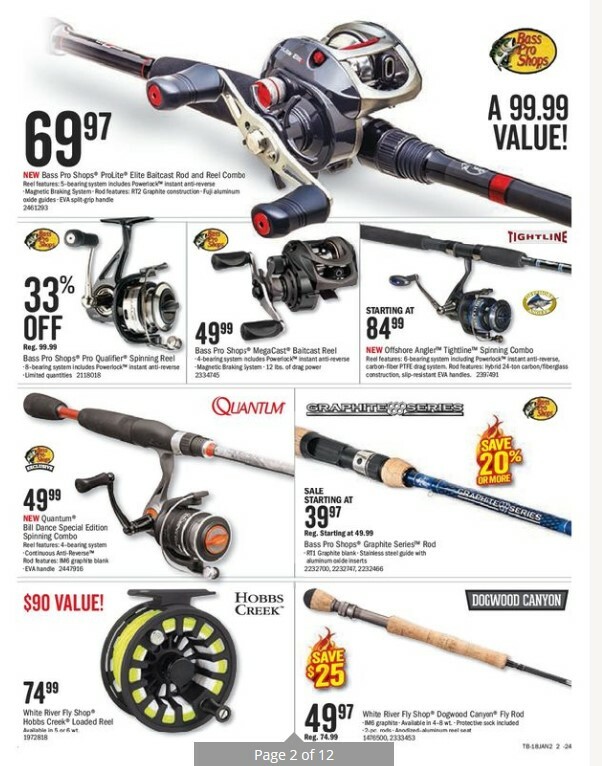 Quantum Bill Dance Special Edition Spinning Combo Model 2447916 $49.99 Sale Price Reel features 4-bearing system. Continuous anti-reverse. Rod features IM6 graphite blank. EVA handle. Bass Pro Shops Graphite Series Rod Model 2232700 2232747 2232466 Starting at $49.99 Regular Price Starting at $39.97 Sale Price 20% Savings RT1 graphite blank. Stainless steel guide with aluminum oxide inserts. White River Fly Shop Hobbs Creek Loaded Reel Model 1972818 $74.99 Sale Price Available in 5 or 6 wt. $90.00 value. White River Fly Shop Dogwood Canyon Fly Rod Model 1476500 2333453 $74.99 Regular Price $49.97 Sale Price $25.00 Savings IM6 graphite. Available in 4-8 wt. Protective sock included. 2-pc. rods. Anodized-aluminum reel seat. Rapala Jigging Rap Starting at $6.79 Regular Price 25% Savings Bass Pro Shops Weekly flyer Bass Pro Shops Speed Shad Model 2080653 $7.29 Regular Price 20% Savings Hook slot on top and bottom.Gary Yamamoto Senko Model 1074735 1084115 $10.99 Regular Price $8.19 Sale Price 25% Savings The Senko's salt impregnated, has a healthy profile, casts like a bullet, and features a unique smooth-and-even horizontal fall when fished weightless or wacky style.